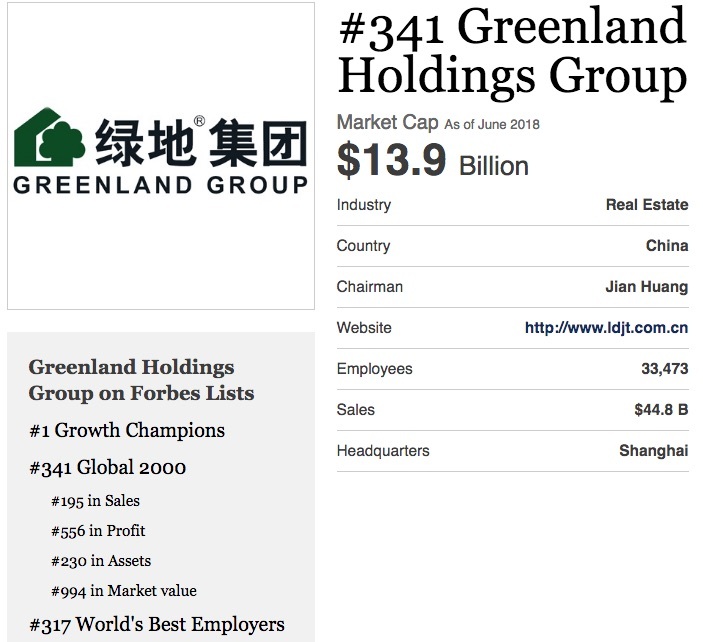 Shanghai-based Greenland Holdings Group, the parent of Greenland USA (the main Atlantic Yards/Pacific Park developer as of now), may not be rising quite as fast as it once projected on the Fortune Global 500, but Forbes magazine last year had some pretty good news. Forbes in 2018 ranked Greenland #341 on the Global 2000 list of largest public companies. Fortune ranked the firm #252, up 25 spots from the previous year's #277--though that was not far above a previous rank. But Forbes--more on this below, since I have questions--also ranked Greenland as the fastest-growing company in the world, based on revenue growth, which was surely related to the firm's rapid overseas expansion. That ranking, through 2017, did not reflect the company's recent pullbacks from investment in California. Nor could it encompass Greenland's subsequent decision to sell development leases in Pacific Park Brooklyn, a sign of caution, which raises questions about its current ambitions. So even if the #1 figure was legitimate, it surely would be tempered by more recent news. Also note the general caution by Chinese developers and real estate investors and Greenland's below investment-grade (aka "junk") bond rating. That growth rate, as well as the Forbes and Fortune rankings, sparked an enthusiastic 7/23/18 press release from Greenland USA, in full at bottom, headlined Greenland Holdings Group Ranks Number One on Forbes 2018 Global Growth Champions List, with the subheading, "Company also Ranks 252nd on Fortune Global 500 List, Jumping 25 Spots Since 2017 Ranking." That's good news for the company. Still, Greenland's pace, compounded by its recent caution, still casts severe doubt on its goal--announced in 2014, as in the screenshot below--to rank among the world's top 100 companies by 2020, which, after all, is next year (and two years of rankings away). By contrast, the better-known Fortune ranking is based solely on revenue in the past fiscal year. Still, it's not easy to harmonize the two magazine's rankings. Note that Forbes--as the screenshot at top shows--ranked Greenland #195 in the world in sales, which is 57 slots higher than Fortune's overall ranking, which covers similar ground. What's the difference? I haven't learned, but they may use different metrics and/or time periods. Notably, as explained in a 7/11/18 article headlined Chinese Companies Lead The 2018 Global 2000 Growth Champions List, Forbes ranked Greenland as the world's leader in growth; which is calculated as "the compound annual growth rate of revenues from 2014 to 2017." Topping the list is Chinese real estate developer Greenland Holdings Group, which saw $44.8 billion in sales and $1.5 billion in profit last year. It jumps up from its third place spot on our 2017 list. The company made headlines last month when it announced a partnership with U.S.-based infrastructure firm AECOM. The companies plan to coordinate on large-scale construction projects globally and, more specifically, in China. Note that the company's 2014 to 2017 growth rate, as described by Fortune, seems significantly different. Fortune cited a slightly lower figure: $43 billion in sales, up from $37.2 billion reported on the 2017 list and $33 billion in 2016, which was a drastic downturn from $42.5 billion in 2015 and $41 billion in 2014. According to the Fortune numbers at least, Greenland's growth trajectory seems significantly less dramatic, instead something of a seesaw, related to the sometimes volatile real estate business and domestic economy. So, which makes more sense, and/or are different metrics at work? I'm not sure. A Greenland spokeswoman declined to comment beyond the firm's press release. I queried Forbes, but didn't get a response. Nor has Greenland's growth led to a jump in stock prices. 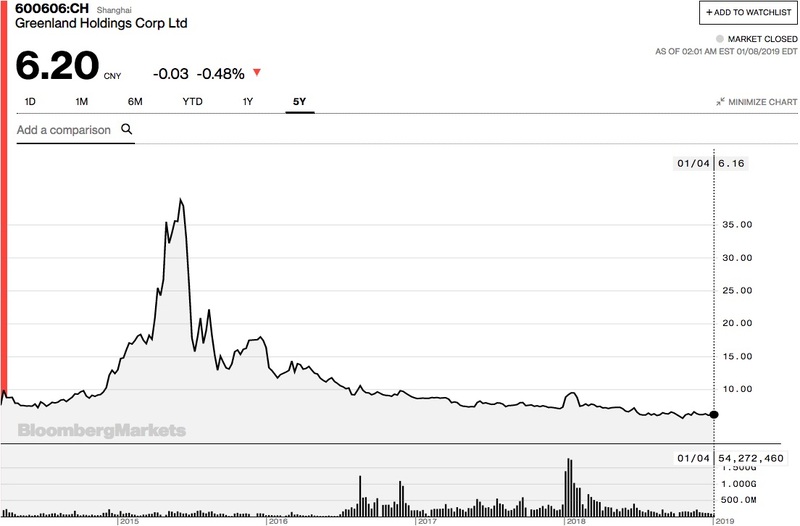 As I wrote recently, after peaking in 2015, just as its listing on the stock exchange began (after a swap with another company), it has retreated near its historic lows, though its one-year performance has not been a dramatic decline. Greenland has been growing enormously: as of that 2016 Forbes ranking, it had 25,621 employees, while more recently Forbes reported 33,473 employees, as cited in the graphic above. Headquartered in Shanghai, this real estate developer was established in 1992 just as the country’s economy was taking off. Its projects include high-rise buildings, urban complexes, business districts and industrial parks. It also is a large property investor in the U.S. and Australia—it’s invested $20 billion in overseas projects since 2013. Last year the company broke ground on its “Metropolis” project in the north of Los Angeles. That development will include a 38-story apartment building and a 19-story hotel with 350 rooms. In January Greenland bought a plot of land in Iskandar Malaysia for $660 million to develop it into a waterfront city. Last year the company’s assets were worth $60.7 billion; profits were up 11%. Note that Greenland's total asset valuation, $60.7 billion, is not part of the more recent assessments by Forbes. But rival magazine Fortune last year measured Greenland's assets at over $130 billion--well more than double the 2015 figure. 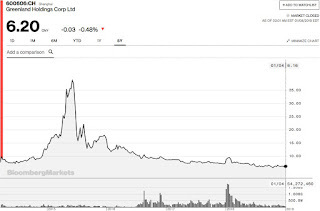 While the Greenland press release noted that the company's Fortune Global 500 ranking of 252 was 25 slots above last year's mark of 277, another perspective suggests that growth, as rated by that magazine, has been less dramatic. That ranking was only six slots above Greenland's 258 rank three years earlier, on the 2015 Fortune Global 500. It was previously 268 in the 2014 listing, a significant jump from 359 in 2013 and 483 in 2012. But the trajectory has been uneven. In 2016, Greenland's rank dropped to 311. In 2017, it recovered to 277, with a 12.8% increase in revenue, to $37.2 billion. In 2018, the ranking of 252 came with some seemingly impressive numbers, a 15.4% increase in revenue and a 23.2% increase in profit. Its revenue of $43 billion exceeded the previous year's $37.2 billion, and its profit of $1.34 billion exceeded the previous year's $1.08 billion. Interestingly enough, though, Fortune did not include--at least on the part of the web site that's free--some other metrics that add perspective. Consider: in 2017 (see below), Fortune measured Greenland's profit as 2.9% of revenues, 1% of assets (which were $105.5 billion), and 13% of stockholder equity. This is a giant company--keep in mind that Forest City Realty Trust had some $8.2 billion in assets at the end of 2016. Greenland remains owned significantly by the government of Shanghai, though since 2015 it's been listed on the Shanghai Stock Exchange, "part of Shanghai’s increasing efforts to make its state-owned enterprises more profitable, efficient and market-based, in keeping with China’s reform agenda," according to a February 2015 press release from Greenland Australia. LOS ANGELES, July 23, 2018 /PRNewswire/ -- Greenland USA is proud to announce that its parent company Greenland Holdings Group has ranked number one on the recently published Forbes 2018 Global Growth Champions list. Greenland Holdings Group made $44.8 billion in sales and $1.5 billion in profit in the last year and has jumped to the number one spot since the release of Forbes' 2017 Global Growth Champions list. Additionally, the company also ranked 252 on the recently released 2018 Fortune Global 500 list. Since debuting on the Fortune 500 list in 2012 as the first Chinese developer, Greenland Holdings Group has been included on the list for seven consecutive years. "As a leading real estate developer ranked number one on the Forbes 2018 Global Growth Champions List and included in the Fortune Global 500 for seven consecutive years, Greenland has always pursued new strategic growth opportunities," said Yuliang Zhang, Chairman of Greenland Group. "We fully understand that big enterprises need to embrace new and emerging technologies. By doing so, companies can achieve transformation and new levels of innovation enabling them to gain unprecedented success in their respective industries." Forbes Global Growth Champions list is an annual ranking of the world's biggest companies by sales, profits, assets, and market value. Forbes partners with Statista, an online statistic, market research and business intelligence portal, to look at the revenue growth of all the companies on the Forbes list. The growth rates where ranked and the top 250 companies made it on the Forbes Global Growth Champions list. 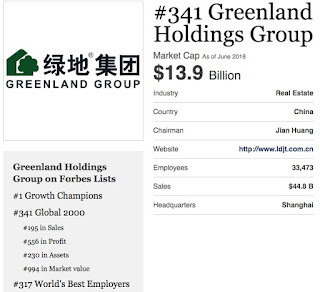 Established in Shanghai, China on July 18, 1992, Greenland Holding Group Co. Limited (also known as "Greenland Group") holds an asset size of over USD $130B and has ranked among Fortune Global 500 for seven consecutive years. Committed to transforming communities around the world, Greenland Group manages projects in over 100 cities in nine countries on four continents. Greenland Group specializes in developing large-scale projects while prioritizing quality and efficiency. The company is a leader in the development of ultra-high-rise buildings, large urban complexes, industrial parks and business districts surrounding transportation centers, such as high-speed railway stations. Currently, there are 23 ultra-high-rise projects under construction or completed by Greenland Group, four of which are among top 10 tallest buildings in the world. Beyond real estate, Greenland Group has diversified its portfolio by expanding into strategic and related industries, such as retail and transportation. Greenland USA is a leading developer of residential and commercial properties that transforms communities. Greenland USA leverages its extensive international track record, commitment to design innovation, quality and efficiency and its local market expertise to develop landmark across the country. It is currently developing the $1B+ property Metropolis in Los Angeles and the $6B+ property Pacific Park Brooklyn in New York. Established in 2013, Greenland USA is a subsidiary of the Greenland Group, which is publicly traded on the Shanghai Stock Exchange (SSE) and ranked 252nd among the Fortune Global 500 in 2018. More information can be found at www.greenlandusa.com.